Brace yourself, 'cause things are about to get Bora-cray real quick. Whenever we’re lucky enough to score a quick escape from our city life, a beach trip almost always comes to mind. And just the thought of good vibes, good food, and good sights (not to mention, a phenomenal nightlife) is enough to summon one of the most long-standing names in Philippine party history: The magical island of Boracay. From the soft sand to the serene blue waters of the sea, right down to the salty breeze against your face, strolling down the island's numerous white beaches is a gift to all your senses. Notable stops are Puka Beach for some peace and quiet, Bulabog Beach for kite surfing, and Tambisaan Beach for snorkeling. End your walk with a relaxing massage by the shore, or an ice-cold beer in your hand. Head over to D'Talipapa Wet Market to pick out the freshest seafood Boracay has to offer. Be sure to bring your haggling skills and most charming personality, because this place will test your bargaining talents. Buy your food by the kilo and have any of the food stalls cook you up a scrumptious feast! Does anyone else smell that garlic butter? 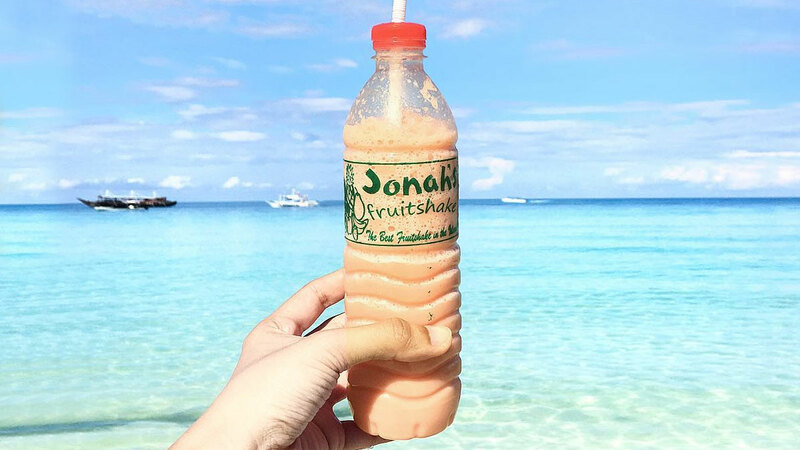 If street food is your thing, not to miss are Jonah's Fruit Shakes (we heard the mango melon and choco banana shakes are a-ma-zing), Two Seasons' four-cheese pizza and oyster sisig (oyster meat fried and sautéed in garlic, onions, and chili), inihaw na pusit (grilled squid), and the king of Boracay favorites, the chori burger (grilled chorizo patty in a bun). Take the leap at Ariel’s Point. Here's a little something for the daredevils. How does a 50-foot cliff jump sound to you? If your-heart-in-your-stomach, adrenaline-pumping-through-your-veins is your kind of rush, then this might just be the highlight of your trip. Plus, the jump earns you some pretty badass bragging points. Note: The entrance fee might be as steep as the cliff itself at P2,500 per person, but don't worry. A lunch buffet, unlimited beer (!!! ), and access to Ariel's Point's other water activities are already included. Adventure all day, party all night! Might as well be Boracay’s motto, don’t you think? During the day, the island is packed with bucket list items waiting to be checked off: Snorkeling, parasailing, helmet diving, ATV riding, affordable sessions of which are available across the entire stretch of White Beach. And as soon as night falls, the party crowds gather at Station 1’s posh resorts, ready to drink and dance until the break of dawn. Have a go at everything to make your trip the ultimate #TravelGoals. And while you’re at it, why not don the cornrow-braids-and-henna-tattoo combo for that authentic local feel? Need a break from all the partying? Spider House sits on the quiet Diniwid Beach, which holds significantly less establishments than its White Beach counterpart. This cliffside resort is the stuff of a perfect holiday cap: a picturesque floating raft, colorful beanbag chairs a la Bali’s La Plancha, and a gorgeous view of the world-famous Boracay sunset.